What Fruits and Vegetables are High in Vitamin D? A deficiency of Vitamin D can lead to rickets, a weakened immune system, increased cancer risk, poor hair growth, and osteomalacia. Excess vitamin D can cause the body to absorb too much calcium, leading to increased risk of heart disease and kidney stones. Sometimes vitamin D values are given in IU (International Units), when this is the case remember that 1μg=40IU for Vitamin D.
Vitamin D is oil soluble, which means you need to eat fat to absorb it. Foods high in vitamin D include fish, mushrooms exposed to sunlight, fortified milk, fortified milk substitutes, fortified tofu, fortified yogurt, fortified breakfast cereals, fortified orange juice, pork chops, and eggs. In addition to foods, Vitamin D is also naturally made by your body when you expose your skin to the sun and is called the sunshine vitamin. Depending on where you live, 20 minutes of sun exposure a day is enough to meet your vitamin D requirement. 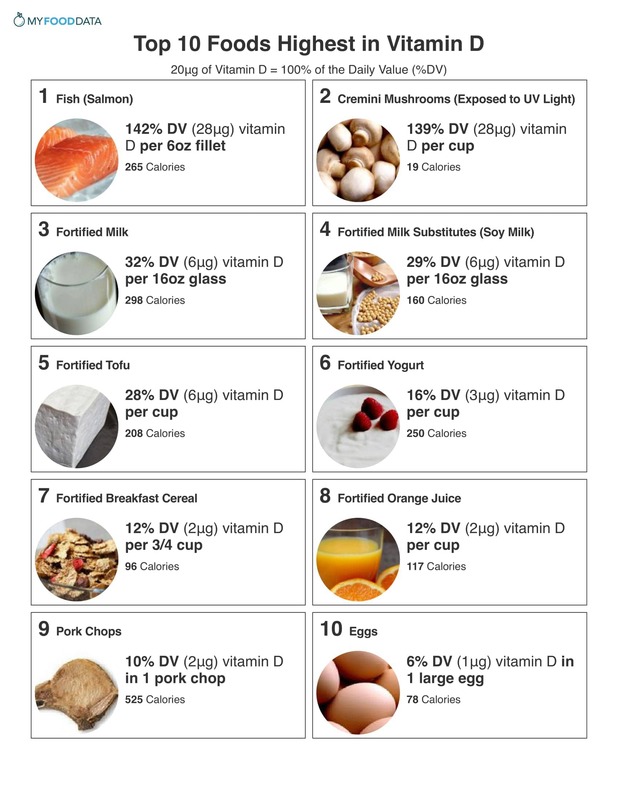 Below is a list of top 10 foods highest in vitamin D by common serving size, for more see the nutrient ranking of 200 foods high in vitamin D.
See all fish high in vitamin D.
Mushrooms create vitamin D from sunlight much like our bodies. Placing any mushroom under the sun for 20 minutes will boost its vitamin D level. See the list of vegetables (mushrooms) high in vitamin D.
Buttermilk, whole milk, low-fat milk, and skim milk all provide around 30% DV per 16oz glass. See all dairy foods high in vitamin D.
Yogurt is also high in calcium. See the list of 155 Breakfast Cereals with Vitamin D.
Note: A cup of orange juice contains up to 20 grams of sugar. See all meats high in vitamin D.
-15% DV in 1 cup of chopped hard-boiled eggs. Vegetables high in vitamin D include mushrooms which have been exposed to sunlight. Other vegan foods high in vitamin D include fortified soy products like tofu, soy milk, and soy yogurt, fortified cereals, and fortified juices. Unfortunately, no fruits are high in vitamin D, and fortified orange juice is currently the only fruit product commonly sold with vitamin D.